For the Vice Admiral (Lord Gambier's uncle), see James Gambier (Royal Navy officer). Admiral of the Fleet James Gambier, 1st Baron Gambier, GCB (13 October 1756 – 19 April 1833) was a Royal Navy officer. After seeing action at the capture of Charleston during the American Revolutionary War, he saw action again, as captain of the third-rate HMS Defence, at the battle of the Glorious First of June in 1794, during the French Revolutionary Wars, gaining the distinction of commanding the first ship to break through the enemy line. Gambier went on to be a Lord Commissioner of the Admiralty and First Naval Lord and then served as Governor of Newfoundland. Together with General Lord Cathcart, he oversaw the bombardment of Copenhagen during the Napoleonic Wars. He later survived an accusation of cowardice for his alleged inaction at the Battle of the Basque Roads. Born the second son of John Gambier, the Lieutenant Governor of the Bahamas and Deborah Stiles, a Bermudian, Gambier was brought up in England by his aunt, Margaret Gambier, and her husband, Admiral Charles Middleton, 1st Baron Barham. He was a nephew of Vice-Admiral James Gambier and of Admiral Lord Barham and became an uncle of the novelist and travel writer Georgiana Chatterton. Gambier entered the Navy in 1767 as a midshipman on board the third-rate HMS Yarmouth, commanded by his uncle, which was serving as a guardship in the Medway, and followed him to serve on board the 60-gun fourth-rate HMS Salisbury in 1769 where he served on the North American Station. He transferred to the 50-gun fourth-rate HMS Chatham under Rear Admiral Parry, in 1772, in the Leeward Islands. Gambier was placed on the sloop HMS Spy and was then posted to England to serve on the 74-gun third-rate HMS Royal Oak, a guardship at Spithead. He was commissioned as a lieutenant on 12 February 1777, in which rank he served successively in the sloop Shark, the 24-gun frigate HMS Hind, the third-rate HMS Sultan under Vice-Admiral Lord Shuldham, and then in HMS Ardent under his uncle's flag. Lord Howe promoted Gambier to commander on 9 March 1778 and gave him command of the bomb ship HMS Thunder, which was promptly dismasted and surrendered to the French. He was taken prisoner for a short period and, after having been exchanged, he was made a post captain on 9 October 1778 and appointed to the 32-gun fifth-rate HMS Raleigh and saw action at the capture of Charleston in May 1780 during the American Revolutionary War. He was appointed commander of fifth-rate HMS Endymion, cruising in British waters, later in the year. In 1783, at the end of the War, he was placed on half-pay. 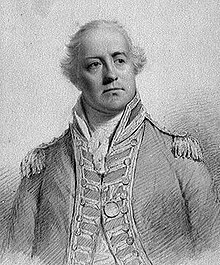 In February 1793 following the start of the French Revolutionary Wars, Gambier was appointed to command the 74-gun third-rate HMS Defence under Lord Howe. By faith an evangelical, he was regarded as an intensely religious man, nicknamed Dismal Jimmy, by the men under his command. As captain of the Defence Gambier saw action at the battle of the Glorious First of June in 1794, gaining the distinction of commanding the first ship to break through the enemy line and subsequently receiving the Naval Gold Medal. Gambier was appointed to the Board of Admiralty led by Earl Spencer in March 1795. Promoted to rear-admiral on 1 June 1795, he became First Naval Lord in November 1795. Promoted to vice-admiral on 14 February 1799, Gambier left the Admiralty after the fall of the first Pitt ministry in February 1801 and became third-in-command of the Channel Fleet under Admiral William Cornwallis, with his flag in the 98-gun second-rate HMS Neptune. He went on to be governor and commander-in-chief of Newfoundland Station in March 1802. In that capacity he gave property rights over arable land to local people allowing them to graze sheep and cattle there and also ensured that vacant properties along the shore could be leased to local people. It was around that time that he also bought Iver Grove in Buckinghamshire. Gambier then returned to the Admiralty as a Lord Commissioner of the Admiralty and First Naval Lord on the Admiralty Board led by Viscount Melville when the second Pitt ministry was formed in May 1804. Promoted to full admiral on 9 November 1805, Gambier left the Admiralty in February 1806. He returned briefly for a third tour as First Naval Lord on the Admiralty Board led by Lord Mulgrave when the Second Portland Ministry was formed in April 1807. In May 1807 Gambier volunteered to command the naval forces, with his flag in the second-rate HMS Prince of Wales, sent as part of the campaign against Copenhagen during the Napoleonic Wars. Together with General Lord Cathcart, he oversaw the bombardment of Copenhagen from 2 September until the Danes capitulated after three days (an incident that brought Gambier some notoriety in that the assault included a bombardment of the civilian quarter). Prizes included eighteen ships of the line, twenty-one frigates and brigs and twenty-five gunboats together with a large quantity of naval stores  for which he received official thanks from Parliament, and on 3 November 1807 a peerage, becoming Baron Gambier, of Iver in the County of Buckingham. In 1808 Gambier was appointed to command the Channel Fleet. In April 1809 he chased a squadron of French ships that had escaped from Brest into the Basque Roads. He called a council of war in which Lord Cochrane was given command of the inshore squadron, and who subsequently led the attack. 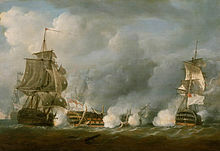 Gambier refused to commit the Channel Fleet after Cochrane's attack, using explosion vessels that encouraged the French squadron to warp further into the shallows of the estuary. This action resulted in the majority of the French fleet running aground at Rochefort. Gambier was content with the blockading role played by the offshore squadron. Admiral Sir Eliab Harvey, who had commanded "Fighting Temeraire" at the Battle of Trafalgar, believed they had missed an opportunity to inflict further damage upon the French fleet. He told Gambier "I never saw a man so unfit for the command of a fleet as Your Lordship." Cochrane threatened to use his parliamentary vote against Gambier in retaliation for not committing the fleet to action. Gambier called for a court martial to examine his conduct. The court martial, on 26 July 1809 on Gladiator in Portsmouth, exonerated Gambier. Consequently, neither Harvey nor Cochrane were appointed by the Admiralty to command for the remainder of the war. The episode had political and personal overtones. Gambier was connected by family and politics to the Tory prime minister William Pitt. In Parliament, Cochrane represented the constituency of Westminster, which tended to vote Radical. In the aftermath of Basque Roads, Cochrane and Gambier quarreled and Gambier resentfully excluded Cochrane from the battle dispatches. There is little wonder that Cochrane took the unusual move of standing in opposition to parliament's pro forma vote of thanks to Gambier. In 1814 Gambier was part of the team negotiating the Treaty of Ghent, ending the War of 1812 between Britain and the United States. He was appointed a Knight Grand Cross of the Order of the Bath on 7 June 1815. Promoted to Admiral of the Fleet on 22 July 1830, he died at his home, Iver Grove in Buckinghamshire, on 19 April 1833 and was buried at St. Peter's churchyard in Iver. Gambier was a founding benefactor of Kenyon College in the United States, and the town that was founded with it. Gambier, Ohio is named after him, as is Mount Gambier, the city and extinct volcano in South Australia, and Gambier Island in British Columbia. Gambier appears as a minor character near the end of Flying Colours, a 1938 Horatio Hornblower novel by C. S. Forester. In July 1788 Gambier married Louisa Matthew; they had no children. ^ a b "James Gambier, 1st Baron Gambier". Oxford Dictionary of National Biography. Retrieved 11 April 2015. ^ "Chatterton, Henrietta Georgiana Marcia Lascelles, Lady Chatterton". Oxford Dictionary of National Biography. Retrieved 11 April 2015. ^ a b c "Sainty, JC, Lord High Admiral and Commissioners of the Admiralty 1660–1870, Office-Holders in Modern Britain: Volume 4: Admiralty Officials 1660–1870 (1975)". pp. 18–31. Archived from the original on 7 October 2014. Retrieved 11 April 2015. ^ "No. 15107". The London Gazette. 12 February 1799. p. 147. ^ "James Gambier, 1st Baron Gambier". Government House, Newfoundland. Retrieved 11 April 2015. ^ "Iver Grove". Parksand Gardens. Retrieved 4 July 2015. ^ "No. 15859". The London Gazette. 5 November 1805. p. 1373. ^ Tracy, N, 2006, pp. 149–50. ^ "No. 16083". The London Gazette. 3 November 1807. p. 1457. ^ "No. 17004". The London Gazette. 18 April 1815. p. 725. ^ "No. 18709". The London Gazette. 23 July 1830. p. 1539. ^ "Biography of Philander Chase". Kenyon College. Retrieved 11 April 2015. Blake, Richard (2008). Evangelicals in the Royal Navy, 1775–1815: Blue Lights and Psalm-singers. The Boydell Press. ISBN 978-1843833598. Forester, Cecil (2011) . Flying Colours. Penguin. ISBN 978-0-241-95549-9. Gannett, Henry (1905). The Origin of Certain Place Names in the United States. Government Printing Office. Grant, James (1803). The narrative of a voyage of discovery, performed in His Majesty's vessel the Lady Nelson, of sixty tons burthen: with sliding keels, in the years 1800, 1801, and 1802, to New South Wales. C. Roworth for T. Egerton. ISBN 978-0-7243-0036-5. Hall, Christopher David (1992). British Strategy in the Napoleonic War, 1803–15. Manchester University Press. ISBN 978-0719036064. Heathcote, Tony (2002). The British Admirals of the Fleet 1734–1995. Pen & Sword. ISBN 0-85052-835-6. Tracy, Nicholas (2006). Who's Who in Nelson's Navy: Two Hundred Heroes. Chatham Publishing. ISBN 978-1861762443. Walbran, Captain John T. (1971). British Columbia Place Names, Their Origin and History (Facsimile reprint of 1909 ed.). Vancouver/Toronto: Douglas & McIntyre. ISBN 0-88894-143-9. Archived from the original on 3 March 2016. "James Gambier, 1st Baron Gambier". Dictionary of Canadian Biography (online ed.). University of Toronto Press. 1979–2016. This article incorporates text from a publication now in the public domain: Chisholm, Hugh, ed. (1911). "Gambier, James Gambier, Baron" . Encyclopædia Britannica. 11 (11th ed.). Cambridge University Press. p. 439.